Lately, I’ve been playing Tiny Dice Dungeon, a cute little game from mobile developer Springloaded. It’s a mobile RPG, so by necessity we’re talking about a game that’s long on basic mechanic, short on story. And indeed, Tiny Dice Dungeon takes refuge in the safety of satire- there’s no real plot, characterization or worldbuilding, and its shortcomings are hand-waved away with jokes. It succeeds in this tonally because of the pixel graphics, which aren’t perfect, but suit the game well enough. The combat mechanic is the real star here, and it’s surprisingly elegant and interesting. Combat in RPGs is generally pretty poor, in a mechanical sense (specifically JRPGs, the style of which Tiny Dice Dungeon is explicitly emulating): My team can attack, it reduces the enemy HP, they do the same to me, and there’s some light randomization to keep it from being predictable. 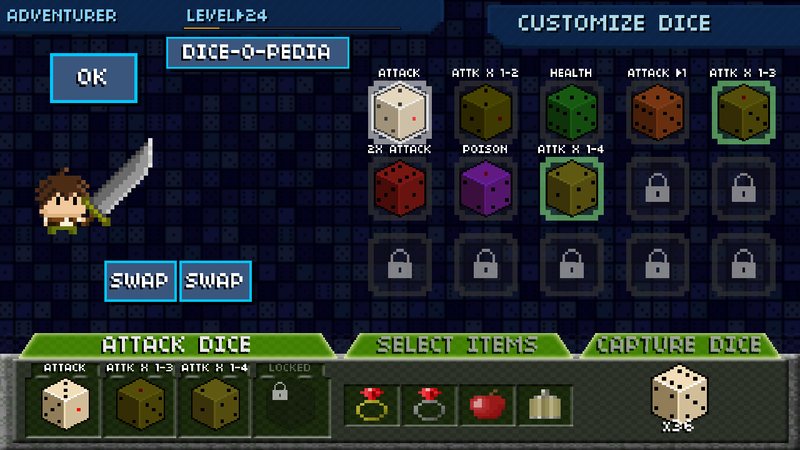 Tiny Dice Dungeon though makes that random element its central mechanic, and makes the dice literal. Heroes have actual dice, from which they draw their power. Mechanically, you roll a dice, and add the result to your total attack. You can keep doing this as many times as you’d like, but if you roll a 1, you forfeit the entire attack. So if you roll a 6, roll again and get a 4, and then attack, you hit for 10. But if you got greedy and went in for another roll and got a 1, you do 0 damage. It’s very simple, but the implications are complex and fun. It immediately gives a sort of “press your luck” feeling, as you try and get a high roll and invariably curse when you then hit a 1. I’ve never been so invested in combat in a game like this- every round felt tactical and fun. The game slowly ramps up the complexity of these dice interactions: you can have two dice, which doubles your chances for hitting an accursed 1, but if you roll a double it doubles your damage. Then other dice are introduced- dice that heal you, dice that do elemental damage, and dice that multiply the damage from other dice. Optimizing your damage requires some neat combinatorial probability math, but even if you don’t get that far into the details it’s still an engaging combat system. Though the game seems very aware of genre-tropes, I think it misses a big opportunity by having a monster-catching mechanic instead of a more common “standard RPG party” approach. I would’ve loved a healer who specializes in healing dice, a rogue with a high risk/high reward dice profile, a tank whose dice block damage, etc etc, but there’s none of that. Instead, you can catch any non-boss monster you fight (with a vaguely annoying ‘try to roll an exact number’ mechanic), and then they fight on your side. That’s cool I guess, but there’s just so many monsters, it’s hard to get invested in them and they all feel very similar mechanically. If there were like, 20 or so RPG-cliche classes, all with different dice set-ups, I would’ve been all about collecting them for my team. 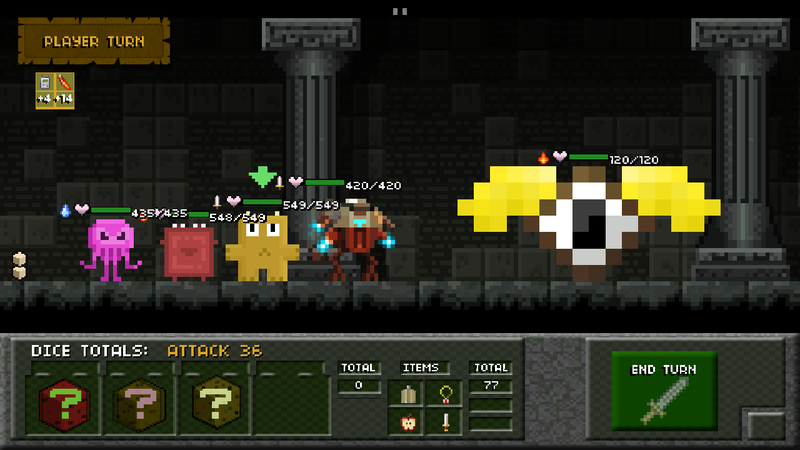 Instead there are 200+ funny pixel monsters. Pass. Oh, I’d also like to touch on how weird the UI is: It very strangely combines the home-base village with every party-management screen. So there’s a “equip dice” screen, and that’s the dice builder’s house. There’s an equipment screen, and that’s the item guy’s house. Everything, besides picking a level, is thematically and visually an NPC’s place of business. It seems like an attempt to thematically justify a mechanical element, but that feels out of place in a game where the heroes wield dice. I can see what they were going for here and it’s a neat idea, but I don’t think it really works in practice. 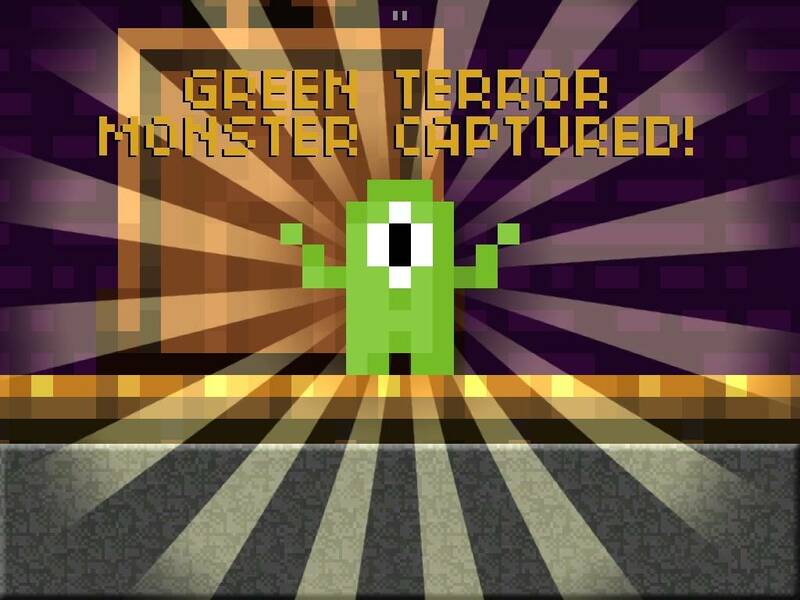 Lastly, it’s a free-to-play game, so of course that means it’s grindy and annoying. While the dice-combat mechanic is really good, it begins to drag since there’s nothing to do besides level grind. 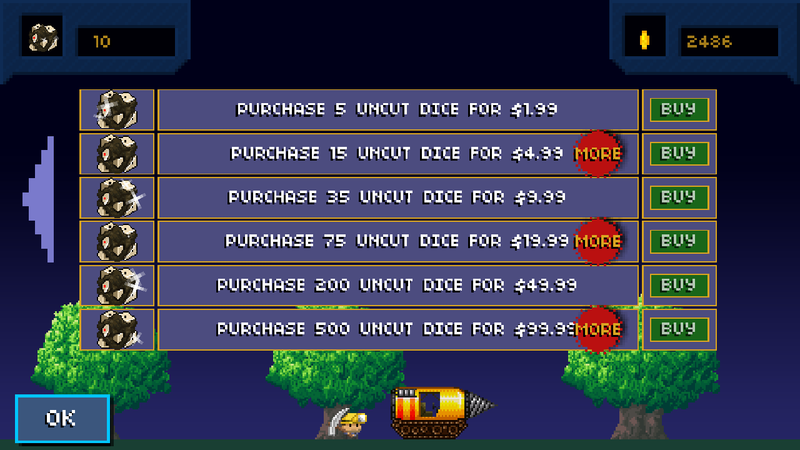 It also seems to have a terrible money to time-saved ratio, in that it takes a lot of money to purchase very few “uncut dice”, the premium currency. For $10 you get 35 uncut dice. 1 uncut dice can do a few minor “skip a time-out delay” sort of things, but (as an example) for 30 uncut dice, you can get a random, potentially rare monster from the monster hunter NPC. There are in-game ways to get uncut dice, and they have other uses, but nearly $10 for a random monster just seems insulting to me. I also utterly despise any sort of “you can only play once every X minutes” monetization scheme, which this game also employs. It seems like an insane thing, as a game designer, to say to your player: “Look, you’re playing my game too much. Stop it. Come back later.” I don’t mind paying to get a cool bonus, or the full game, or to get rid of ads, or something similar, but the time-based lockout seems so contrary to good design. All in all, I really like Tiny Dice Dungeon, as the core mechanic feels fresh and is a ton of fun to play. I just wish it was a better game overall, took better advantage of that core mechanic, and wasn’t saddled with so much free-to-play crap. One hopes a better game will come along and put some of those dice-gambling mechanics to better use someday. You dont know a better game that uses dice? I certainly do? But I didn’t say I hope a better game comes along using dice, because that would insane. Although I sort of like the idea of someone discovering dice for the first time and finding it a novel mechanic- “Quite interesting! More games should use these chance producing polyhedra!” Sadly, I’m all too familiar with dice. But no, I was referring specifically to the particular dice mechanic (or family of mechanics) that Tiny Dice Dungeon uses, which is basically a single player variant of the folk game Pig. I think it’s a meaningful accomplishment to put a spin on a classic game mechanic as Tiny Dice Dungeon does, and I hope other games do so in the future in even better ways (and I’m sure there are older games that do so as well). Like Tharsis for example, that uses some traditional dice gambling mechanics but re-purposes them in novel ways (it came out awhile after I wrote this post though). That’s what I was getting at anyway.